A large range of competitively priced stainless steel adjustable tilting feet. These articulating feet have conical black nylon base dimensions from 40mm to 50mm with stainless steel threads ranging in sizes from M6, M8, M10 to M12. These anti corrosive furniture feet have thread lengths from 20mm up to 100mm to suit your application and level of adjustment. Stainless Steel Conveyor Furniture Feet are adjustable feet with stainless steel thread of M10, M12 and M16 thread size. We can offer these conveyor furniture feet with either a heavy duty plastic base or a stainless steel base. 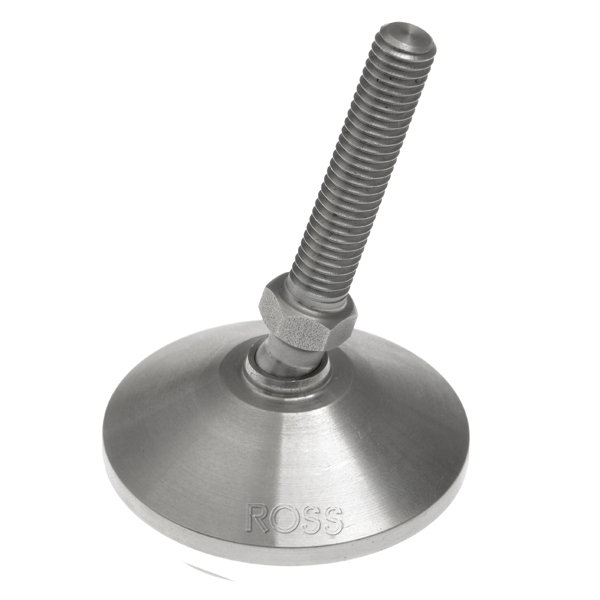 These stainless steel conveyor feet are ideal for food manufacturing equipment, hospitals, catering equipment and ideal for out door applications as the thread and base will not rust. Stainless steel conveyor feet are resistant to corrosion, will not rust and can meet strict health and safety regulations. With load tolerances of up to 400kg each these versatile stainless steel conveyor feet will suit many applications.